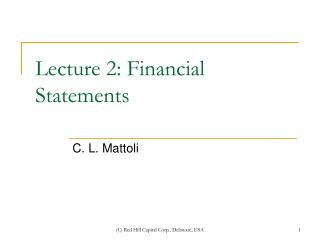 FNCE 4070: FINANCIAL MARKETS AND INSTITUTIONS Lecture 5: The Term Structure of Interest Rates. Yield Curves: How do we Construct a Yield Curve and What are the Theories which Explain Yield Curves. Where is this Financial Center?. 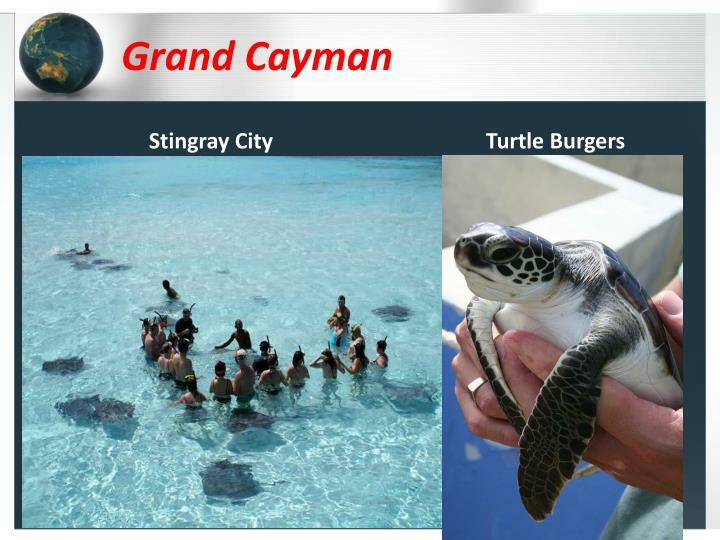 Grand Cayman. Stingray City. 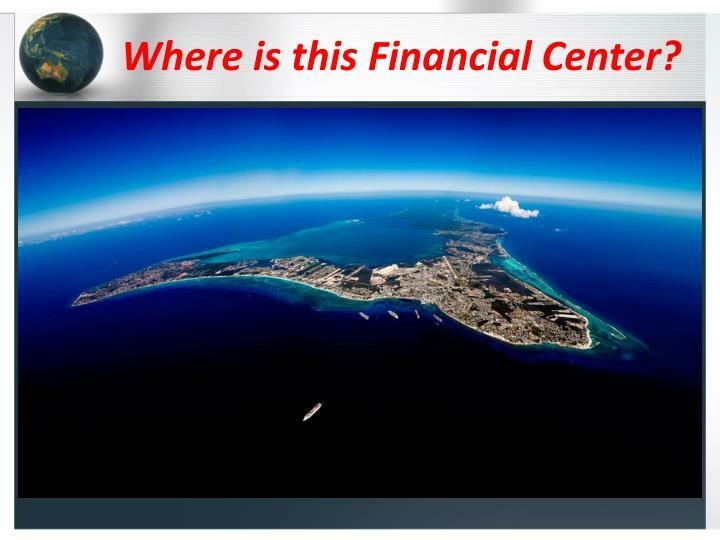 Where is this Financial Center? 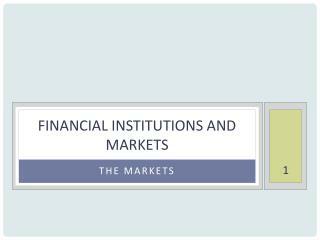 Offshore Financial Center: Countries or jurisdictions with financial centers that contain financial institutions that deal primarily with nonresidents and foreign currency transactions on a scale out of proportion to the size of its economy (OECD definition). 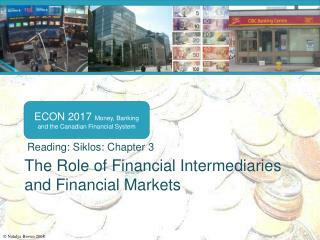 Characterized by a low (or zero) tax environment and specializing in providing corporate and commercial services (including investment services) to non-resident entities on a confidential basis. .
533 banks, with approximately US$415 billion in deposits (making it fifth largest financial center in the world). 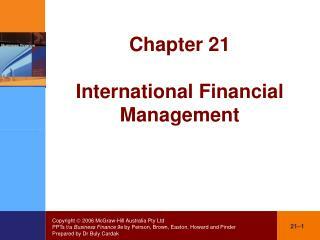 Other financial companies include insurance, cash management, asset management (including hedge funds). Foreign companies generally register as an “exempted company” because they are guaranteed against any future taxes for at least 30 years. 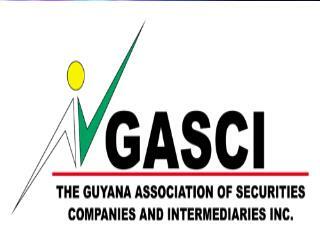 In addition, its list of shareholders is not open to public inspection, they do not have to file annual returns and no annual audits are required. There are no personal income taxes, no corporate income taxes, no capital gains taxes, no withholding taxes, no estate, gift or inheritance taxes, no sales taxes in the Cayman Islands. 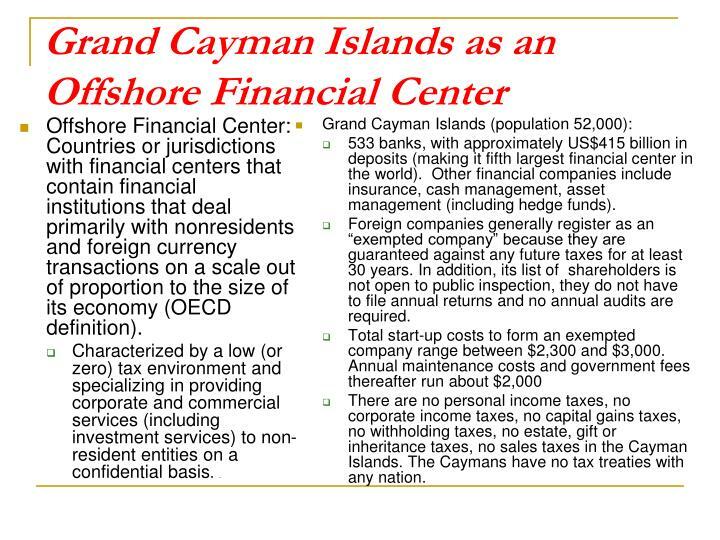 The Caymans have no tax treaties with any nation. Inflationary expectations, risk of default, business cycles, flight to safety, and term to maturity. 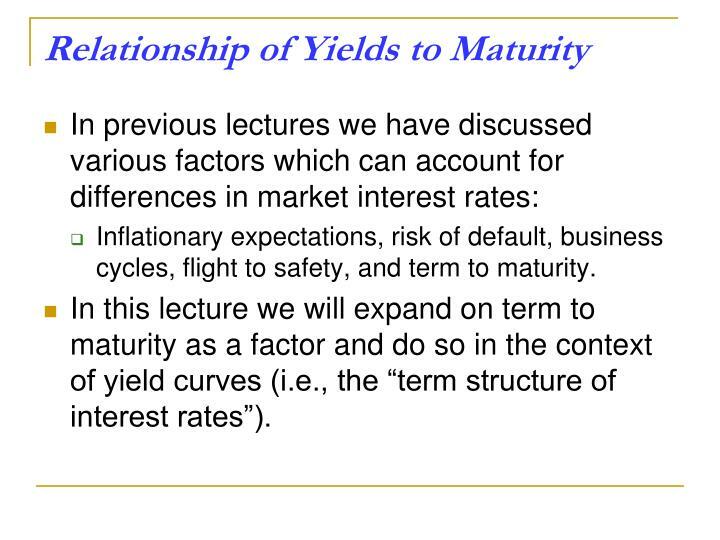 In this lecture we will expand on term to maturity as a factor and do so in the context of yield curves (i.e., the “term structure of interest rates”). 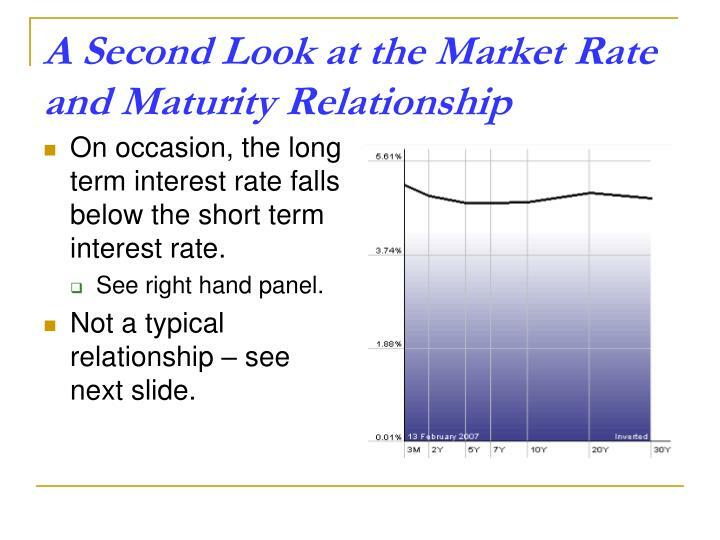 “Normally,” longer term interest rates are above shorter term interest rates. Even when we adjust for default risk (e.g., just looking at Treasuries – see right hand panel, this is the case. Why do you think this is a normal relationship? 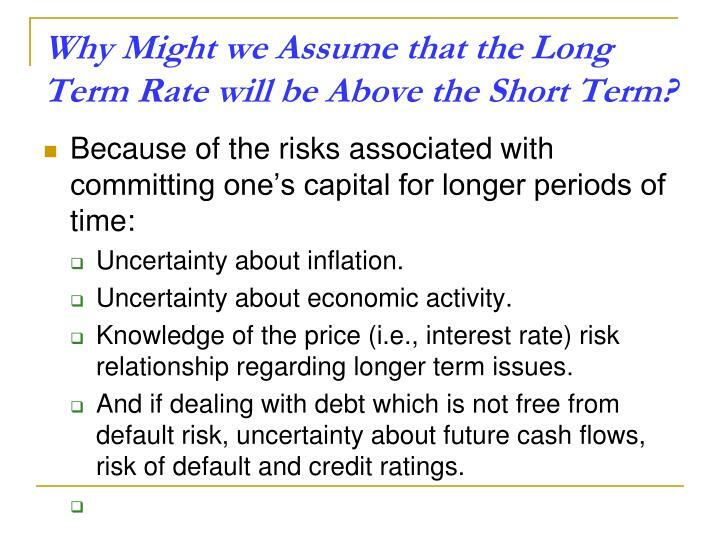 Why Might we Assume that the Long Term Rate will be Above the Short Term? Knowledge of the price (i.e., interest rate) risk relationship regarding longer term issues. 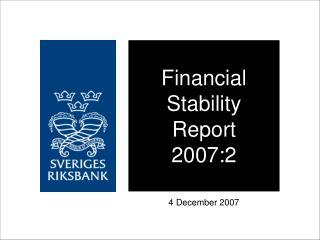 And if dealing with debt which is not free from default risk, uncertainty about future cash flows, risk of default and credit ratings. On occasion, the long term interest rate falls below the short term interest rate. Not a typical relationship – see next slide. 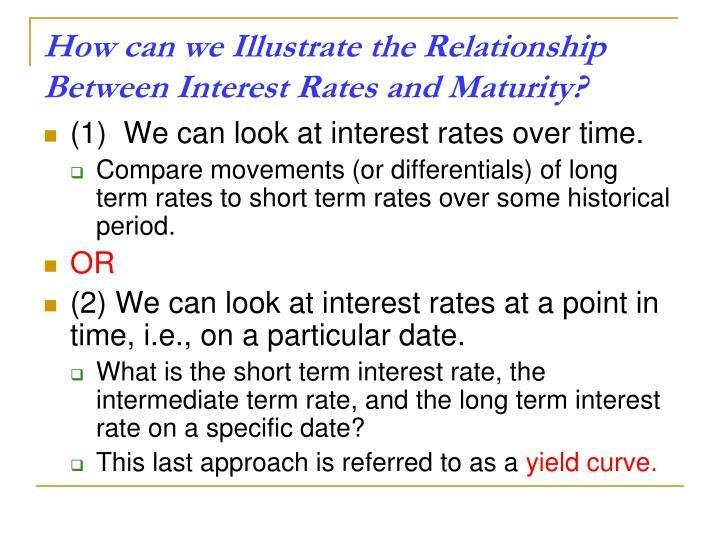 How can we Illustrate the Relationship Between Interest Rates and Maturity? 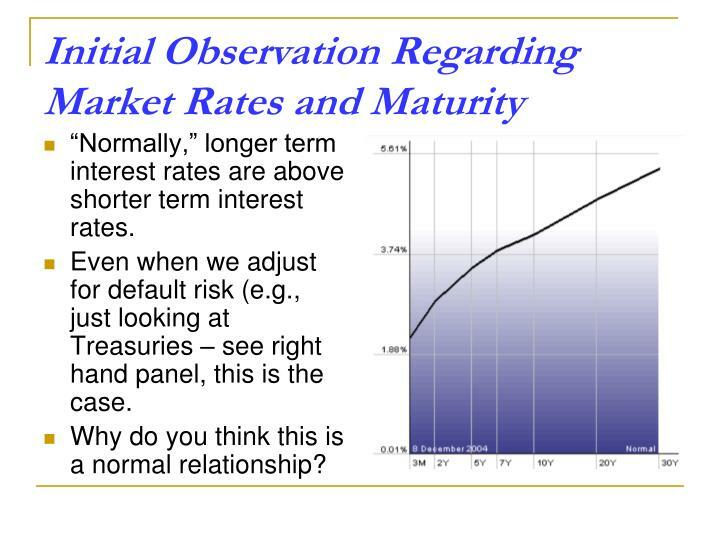 (1) We can look at interest rates over time. 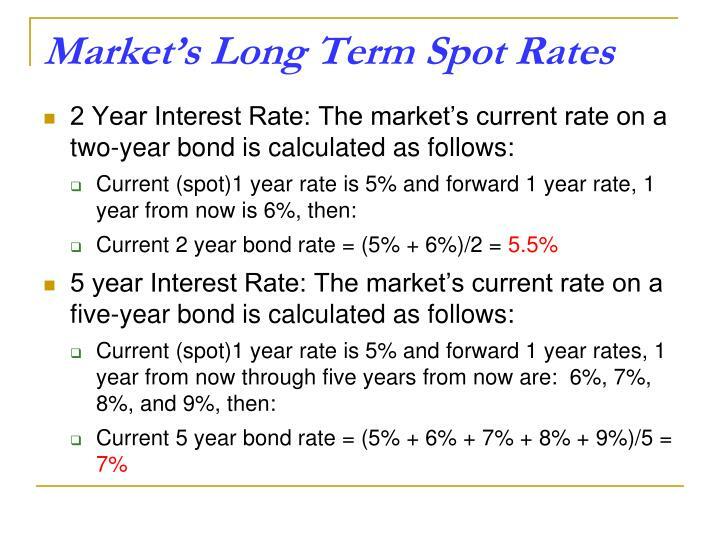 Compare movements (or differentials) of long term rates to short term rates over some historical period. 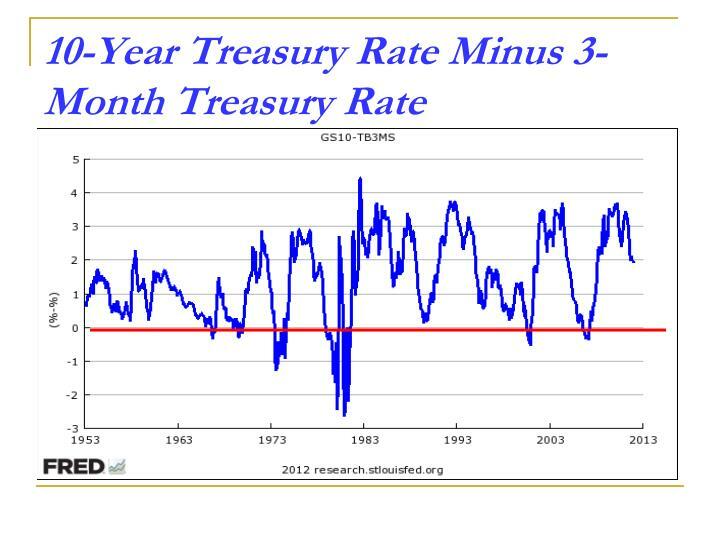 (2) We can look at interest rates at a point in time, i.e., on a particular date. 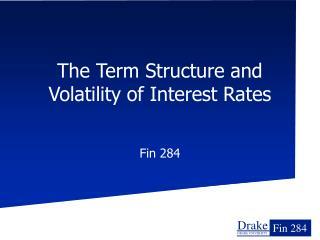 What is the short term interest rate, the intermediate term rate, and the long term interest rate on a specific date? 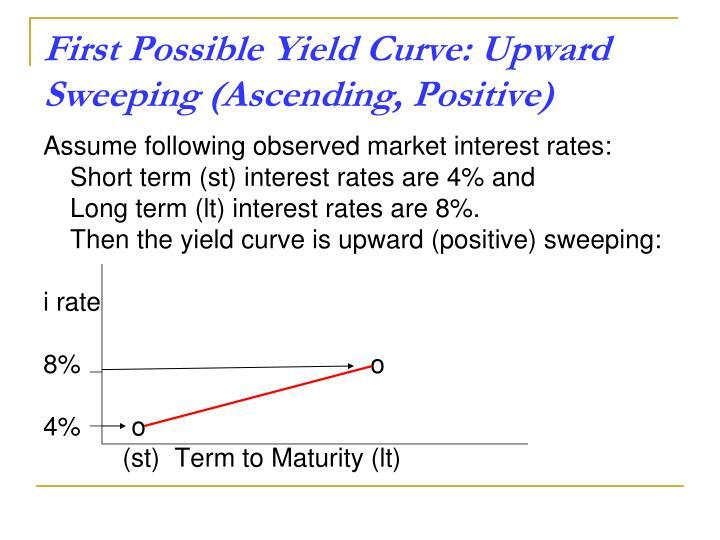 This last approach is referred to as a yield curve. 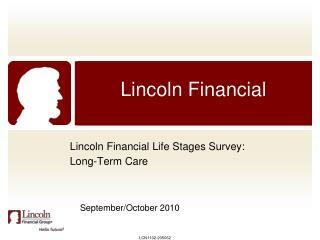 Long term (lt) interest rates are 8%. 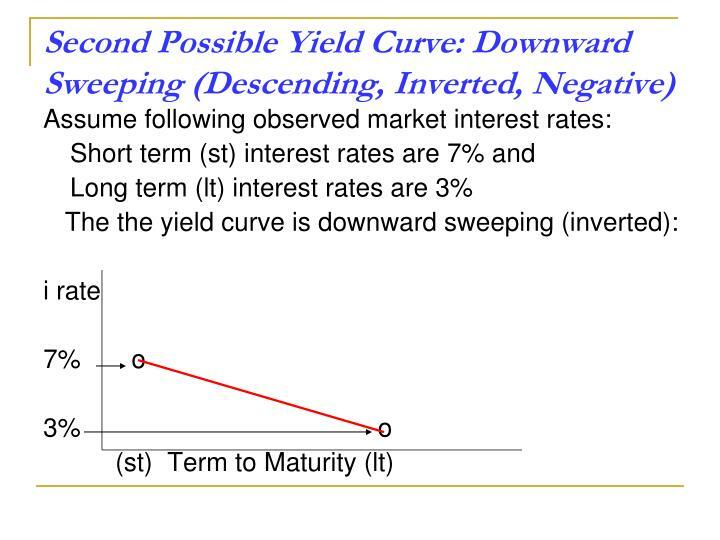 Descending Yield Curves (“Downward Sloping; Inverted; Negative”) : Short term interest rates higher than long term interest rates. 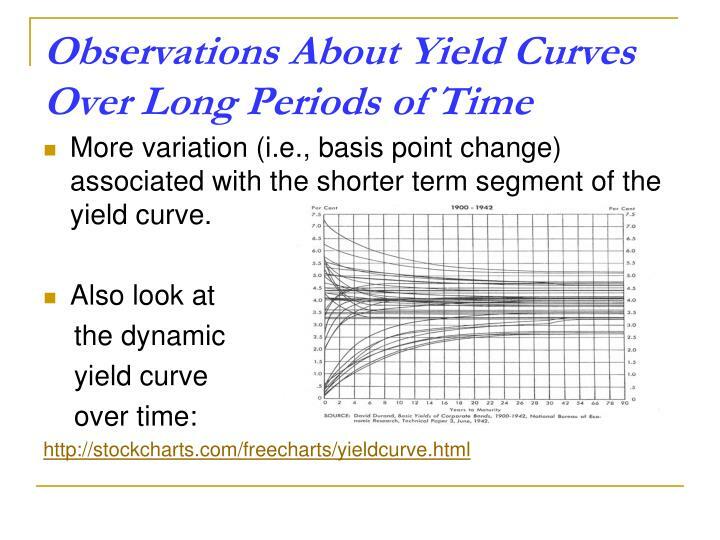 (Relatively) FlatYield Curves: Long term and short term rates essentially the same. 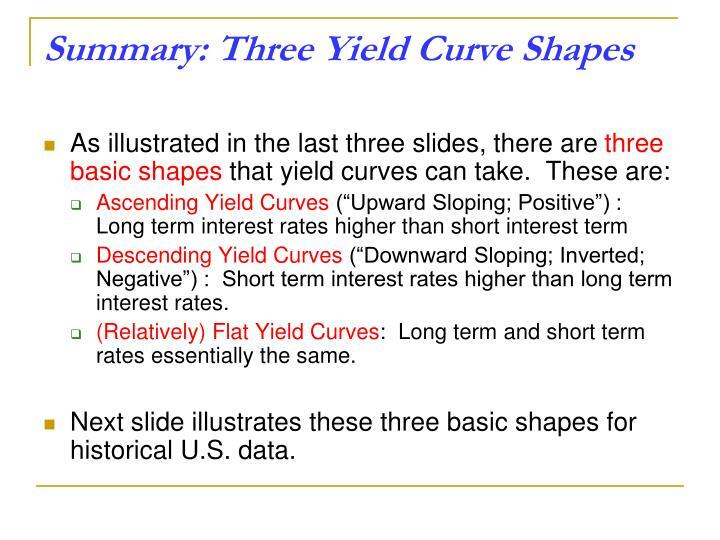 Next slide illustrates these three basic shapes for historical U.S. data. 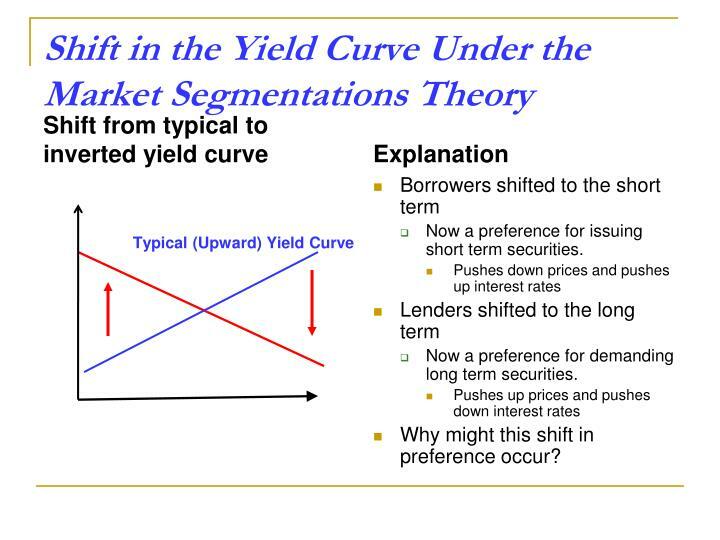 More variation (i.e., basis point change) associated with the shorter term segment of the yield curve. 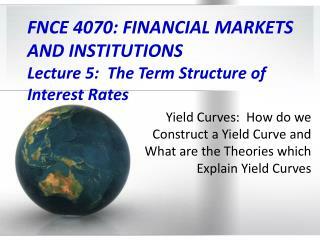 How Do We Construct a Yield Curve? 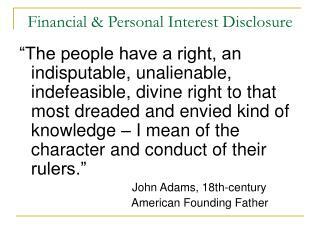 What Debt Instrument Should We Use? 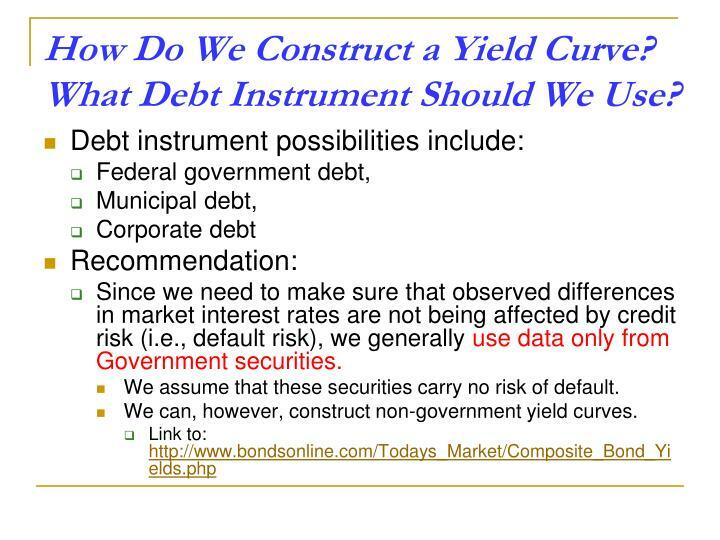 Since we need to make sure that observed differences in market interest rates are not being affected by credit risk (i.e., default risk), we generally use data only from Government securities. We assume that these securities carry no risk of default. We can, however, construct non-government yield curves. How Do We Actually Construct a Yield Curve? 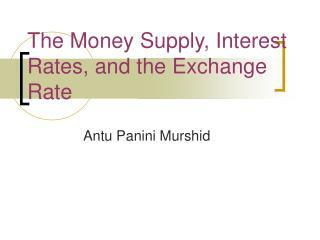 What Interest Rate Should We Use? 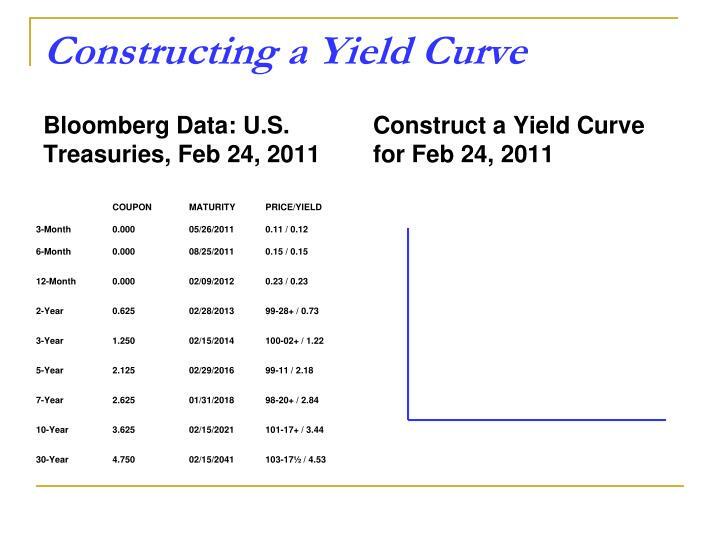 Current yield = coupon payment/market price of bond. 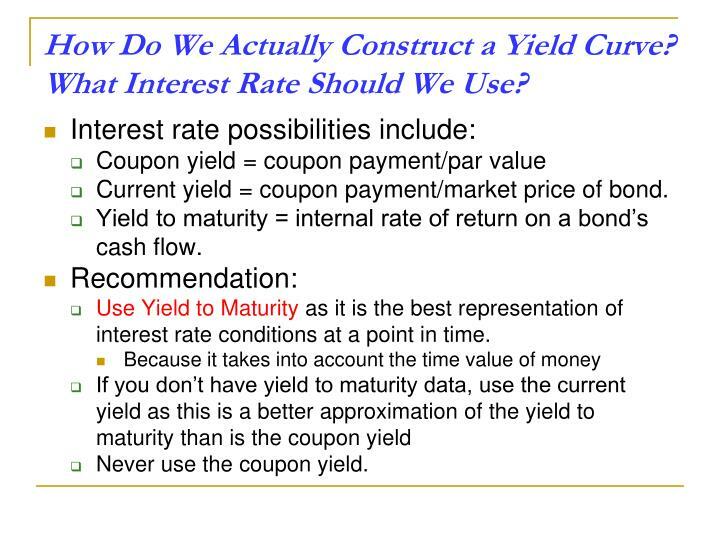 Yield to maturity = internal rate of return on a bond’s cash flow. 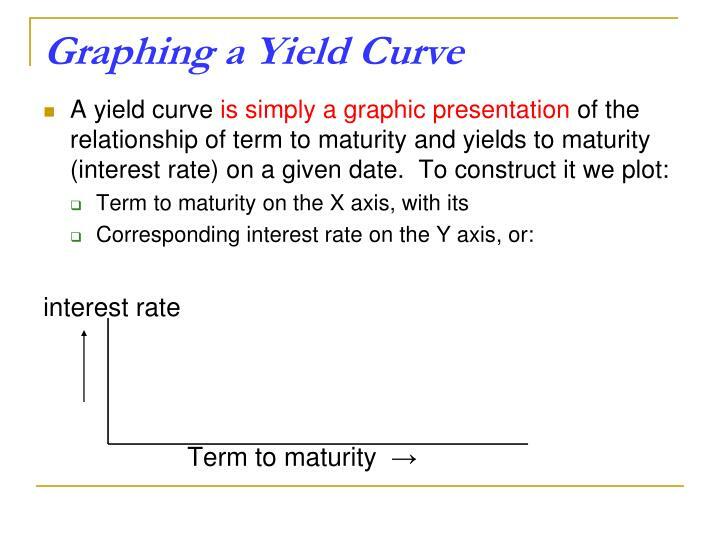 Use Yield to Maturity as it is the best representation of interest rate conditions at a point in time. Never use the coupon yield. 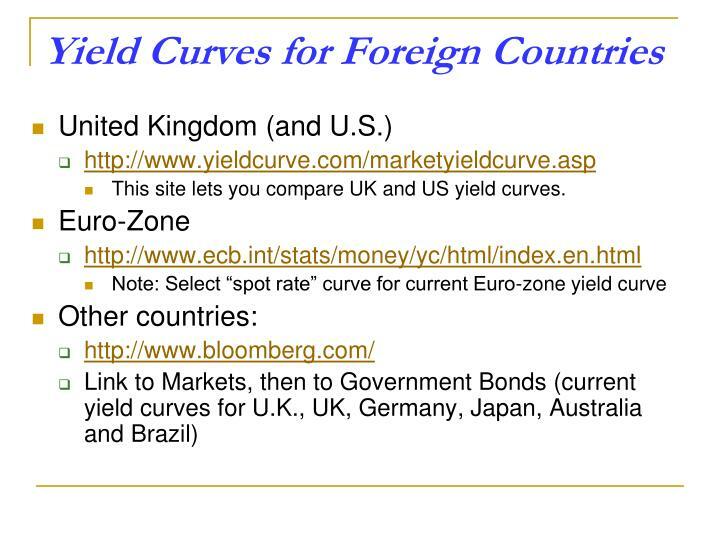 This site lets you compare UK and US yield curves. (2) Forecasting future interest rates. 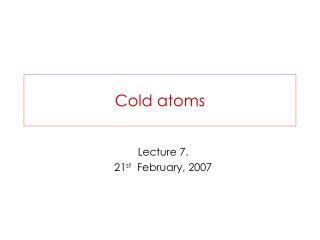 Note: Forecasting is covered in next lecture. 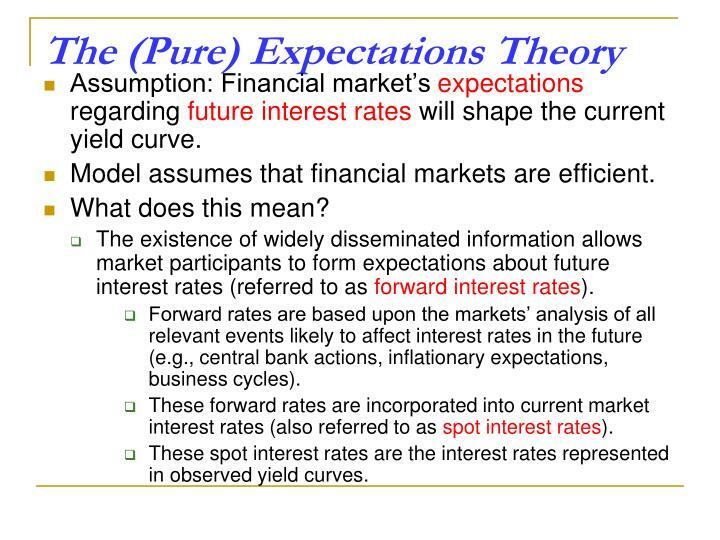 Assumption: Financial market’s expectations regarding future interest rates will shape the current yield curve. 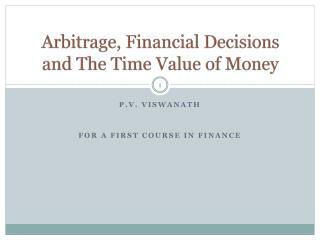 Model assumes that financial markets are efficient. 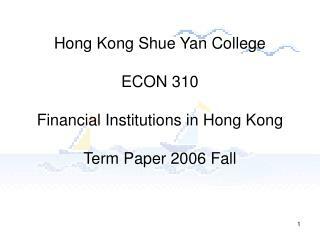 The existence of widely disseminated information allows market participants to form expectations about future interest rates (referred to as forward interest rates). Forward rates are based upon the markets’ analysis of all relevant events likely to affect interest rates in the future (e.g., central bank actions, inflationary expectations, business cycles). 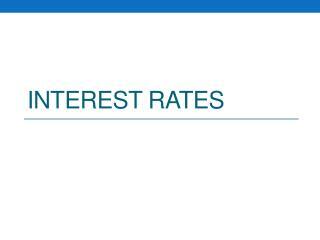 These forward rates are incorporated into current market interest rates (also referred to as spot interest rates). 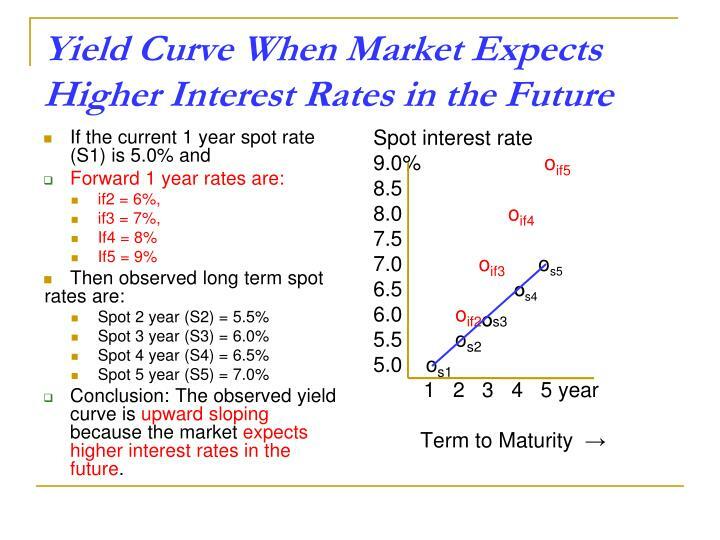 These spot interest rates are the interest rates represented in observed yield curves. 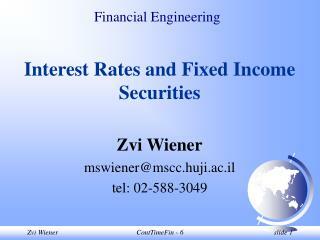 (2) expected, or forward, interest rate. 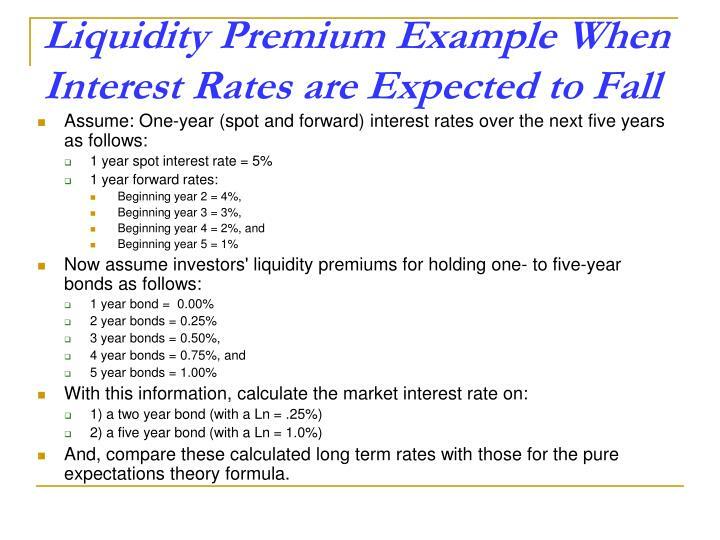 (2) the forward 1 year interest rate, 1 year from now is 5%. Also, assume there is no risk of default and no required premium for longer term financial assets. Given the above, what will the market set as the current 2 year spot interest rate? 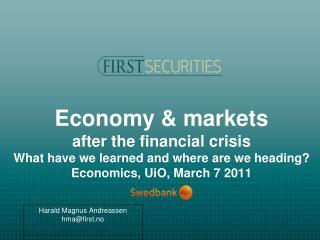 And there is no risk of default and no required premium for longer term financial assets. 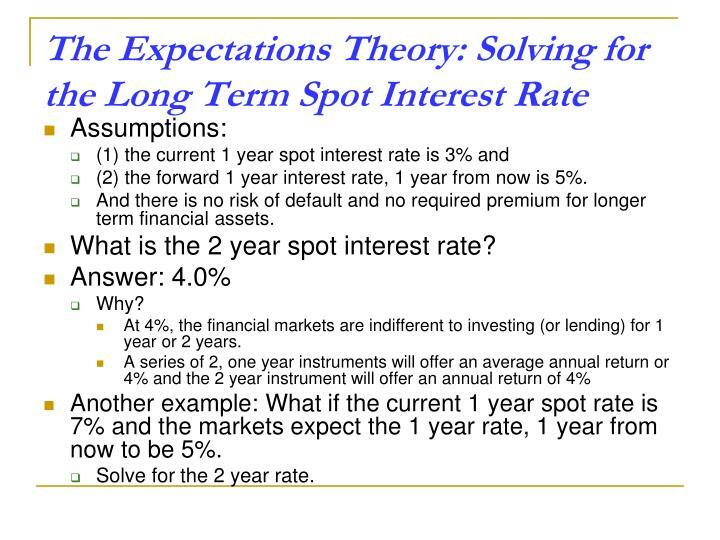 What is the 2 year spot interest rate? At 4%, the financial markets are indifferent to investing (or lending) for 1 year or 2 years. Another example: What if the current 1 year spot rate is 7% and the markets expect the 1 year rate, 1 year from now to be 5%. Solve for the 2 year rate. 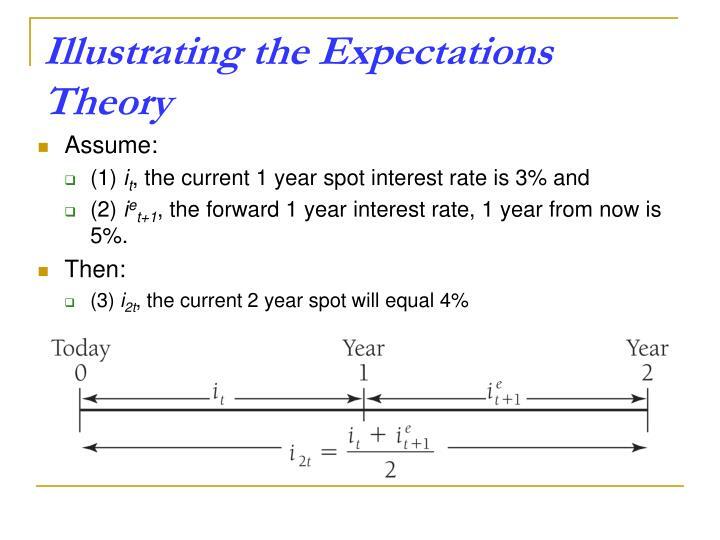 (2) iet+1, the forward 1 year interest rate, 1 year from now is 5%. 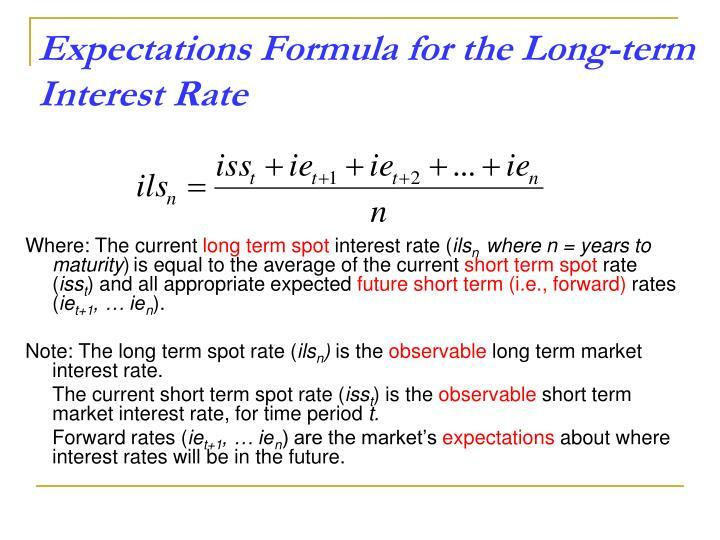 Where: The current long term spot interest rate (ilsn where n = years to maturity)is equal to the average of the current short term spot rate (isst) and all appropriate expected future short term (i.e., forward) rates (iet+1, … ien). 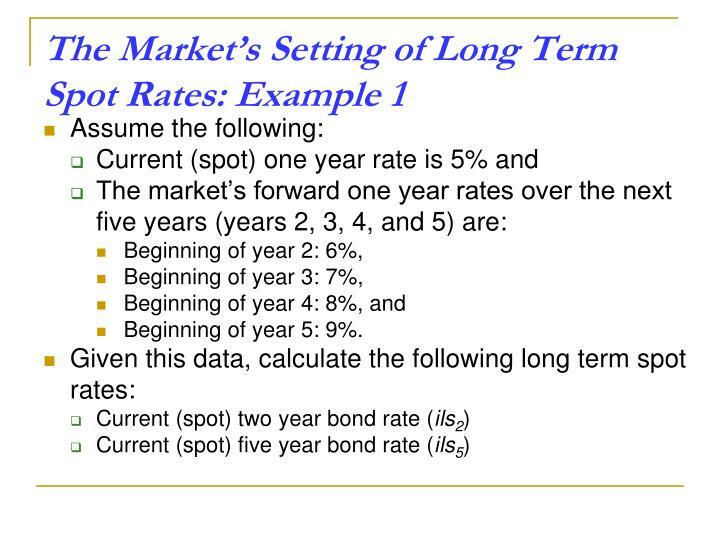 Note: The long term spot rate (ilsn) is the observable long term market interest rate. 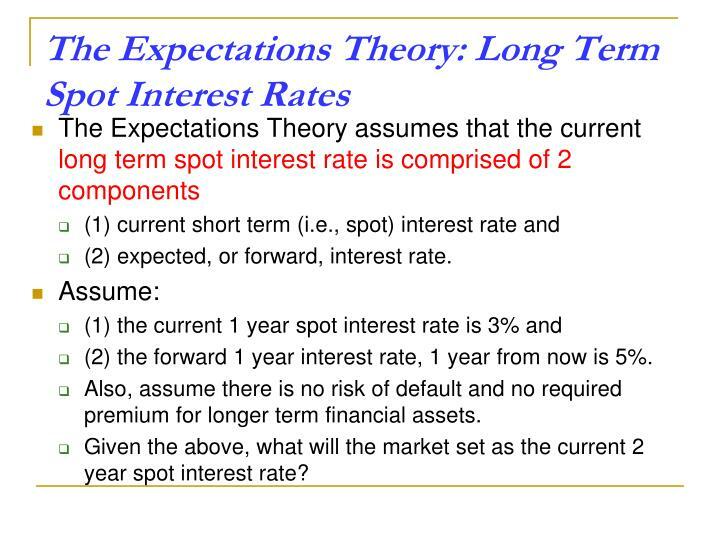 The current short term spot rate (isst) is the observable short term market interest rate, for time period t.
Forward rates (iet+1, … ien) are the market’s expectations about where interest rates will be in the future. Beginning of year 5: 9%. If interest rates are expected to rise in future, forward rates will be above today's spot rates. The higher forward rates will result in higher observed spot rates. The current (spot)1 year rate was 5% and forward 1 year rate, 1 year from now was 6%. 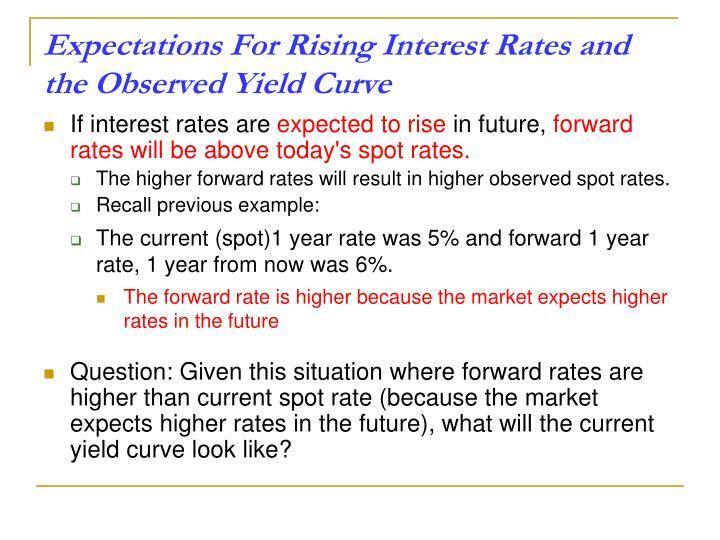 Question: Given this situation where forward rates are higher than current spot rate (because the market expects higher rates in the future), what will the current yield curve look like? 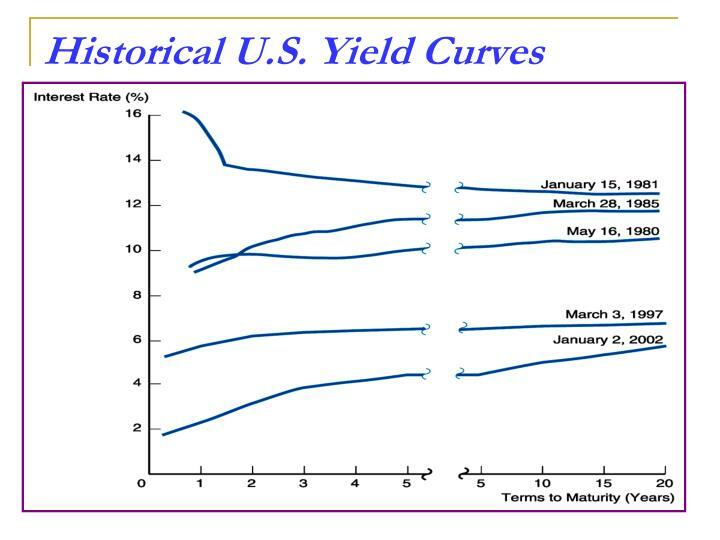 Conclusion: The observed yield curve is upward sloping because the market expects higher interest rates in the future. If interest rates are expected to fall in future, forward rates will be below today's spot rates. 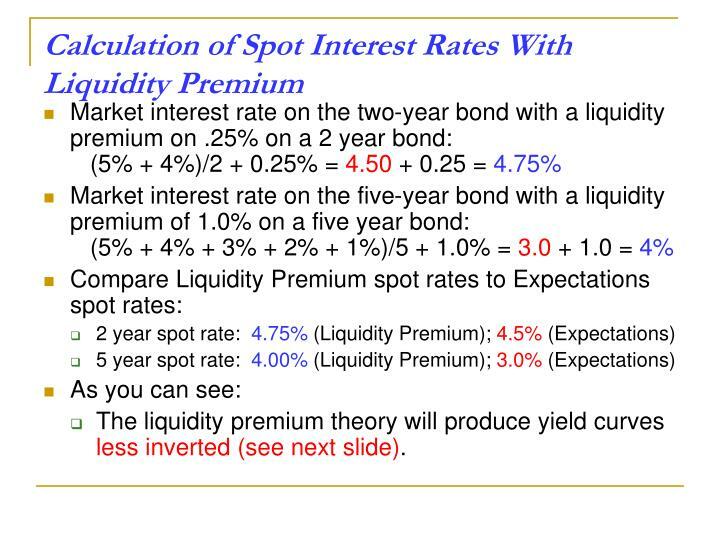 Thus, lower forward rates result in lower observed spot rate. 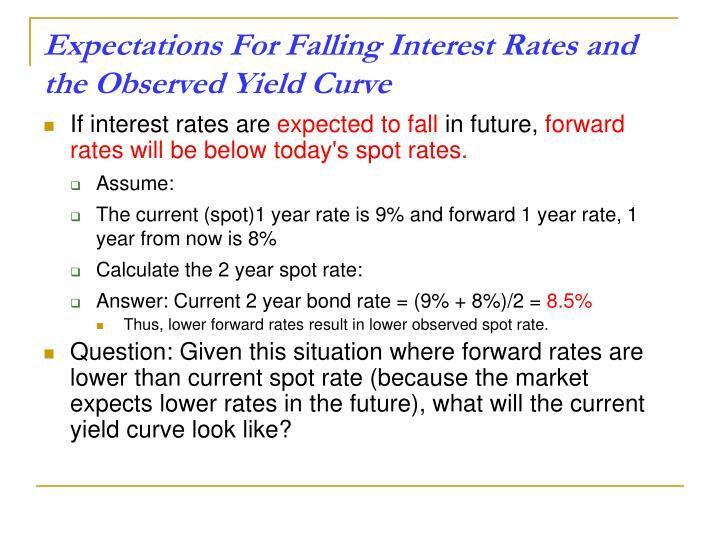 Question: Given this situation where forward rates are lower than current spot rate (because the market expects lower rates in the future), what will the current yield curve look like? 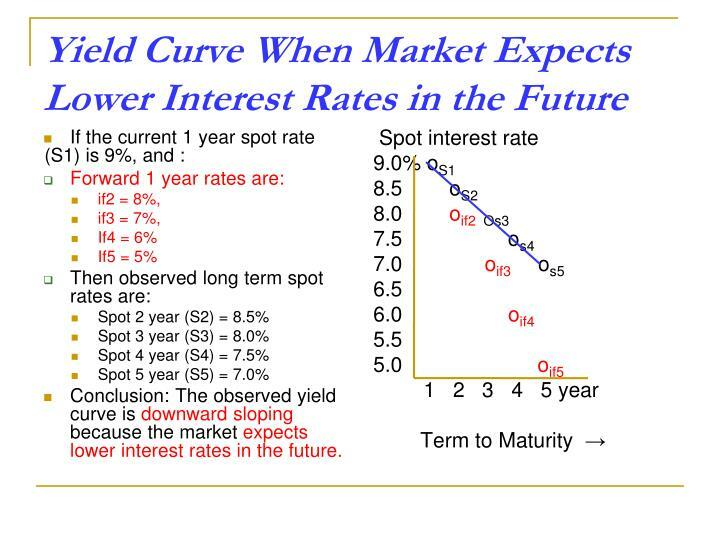 Conclusion: The observed yield curve is downward sloping because the market expects lower interest rates in the future. 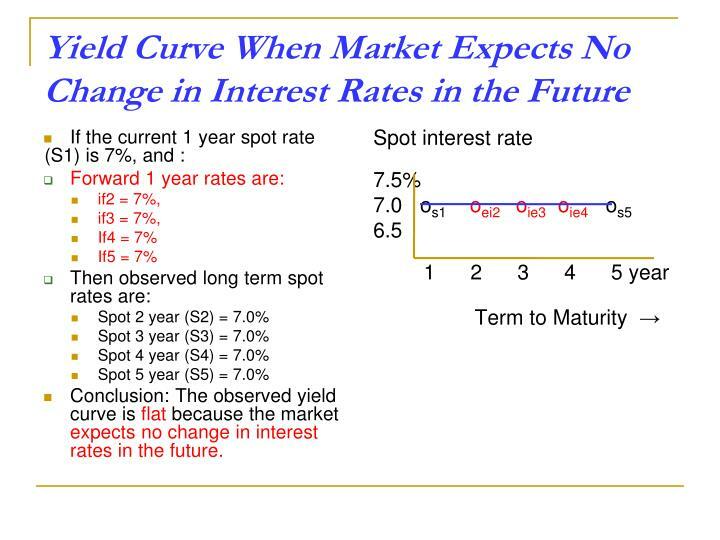 Conclusion: The observed yield curve is flat because the market expects no change in interest rates in the future. 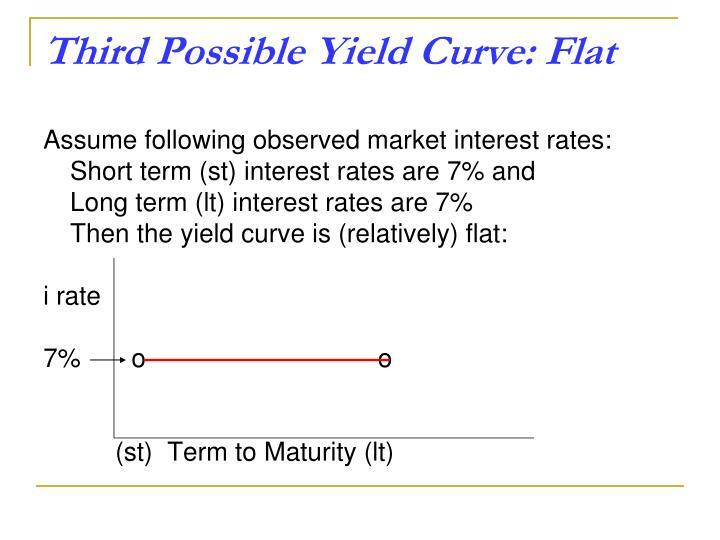 The shape and slope of the yield curve reflects the markets’ expectations about future interest rates. Future (forward) interest rates are expected to increase above existing spot rates. 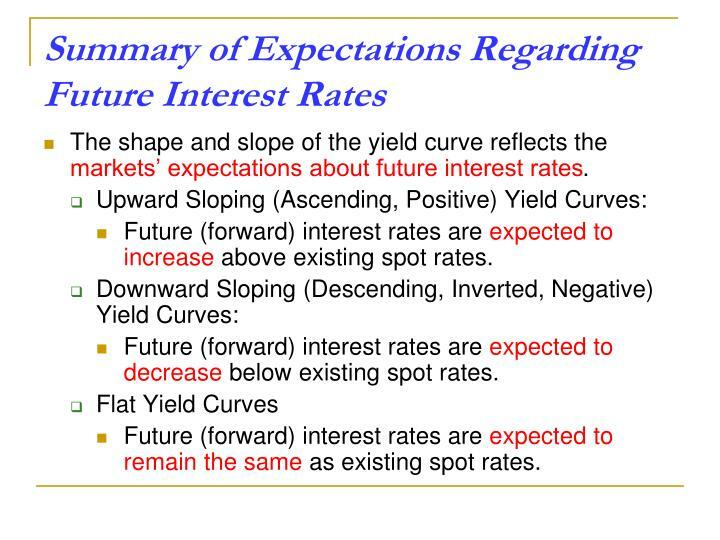 Future (forward) interest rates are expected to decrease below existing spot rates. Future (forward) interest rates are expected to remain the same as existing spot rates. 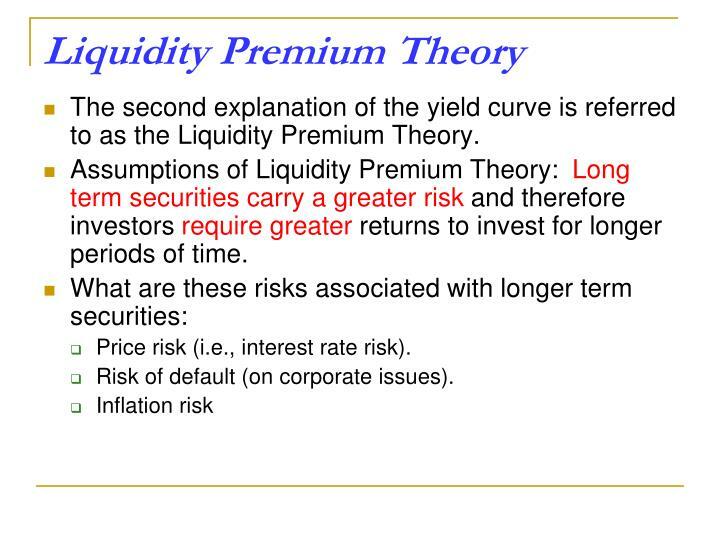 The second explanation of the yield curve is referred to as the Liquidity Premium Theory. 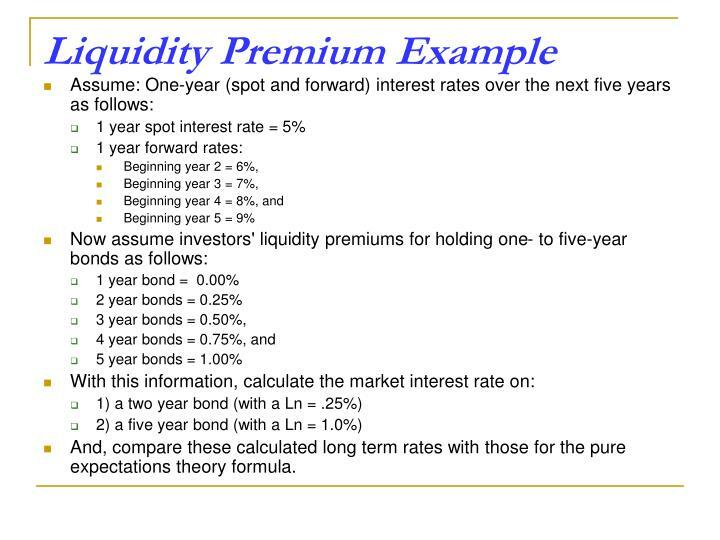 Assumptions of Liquidity Premium Theory: Long term securities carry a greater risk and therefore investors require greater returns to invest for longer periods of time. Price risk (i.e., interest rate risk). Risk of default (on corporate issues). 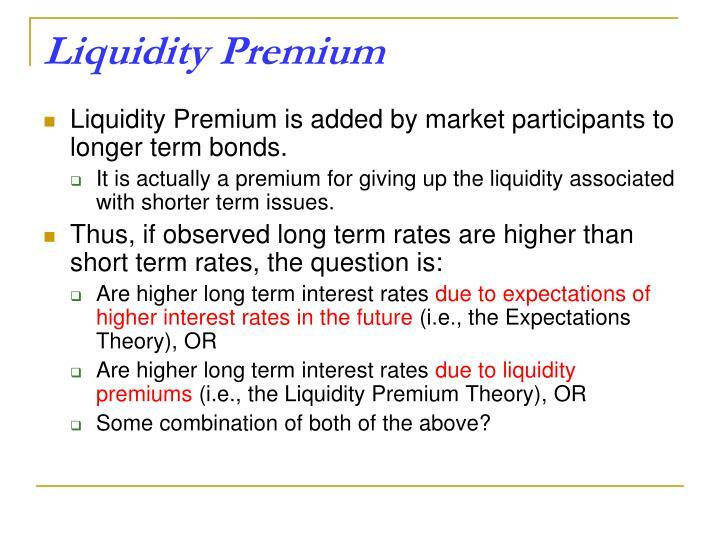 Liquidity Premium is added by market participants to longer term bonds. It is actually a premium for giving up the liquidity associated with shorter term issues. Some combination of both of the above? 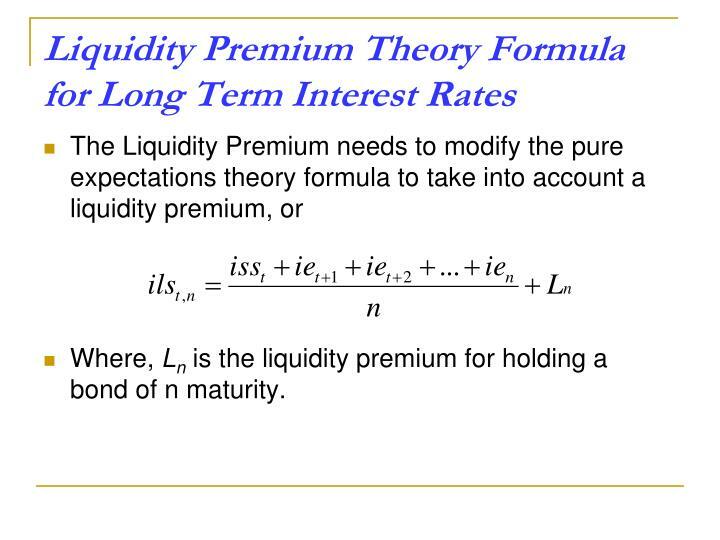 Where, Ln is the liquidity premium for holding a bond of n maturity. 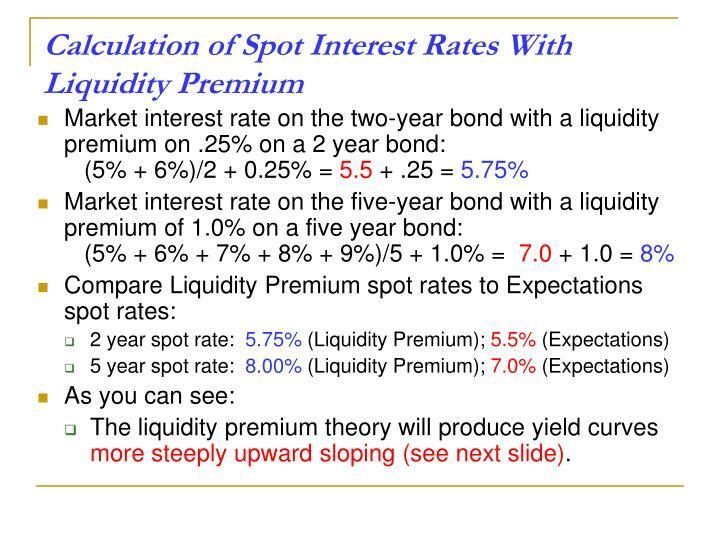 And, compare these calculated long term rates with those for the pure expectations theory formula. 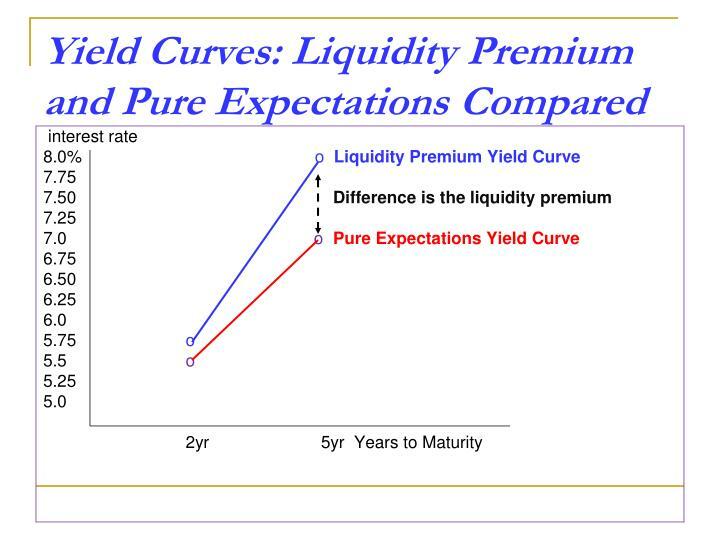 The liquidity premium theory will produce yield curves more steeply upward sloping (see next slide). 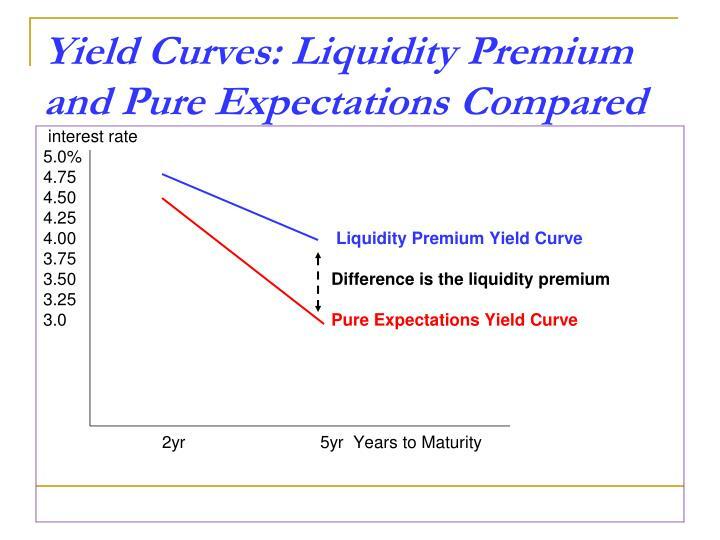 The liquidity premium theory will produce yield curves less inverted (see next slide). 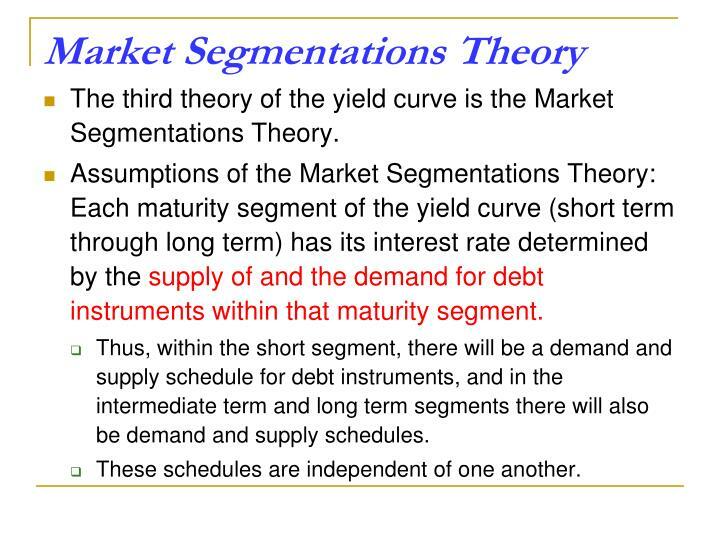 The third theory of the yield curve is the Market Segmentations Theory. 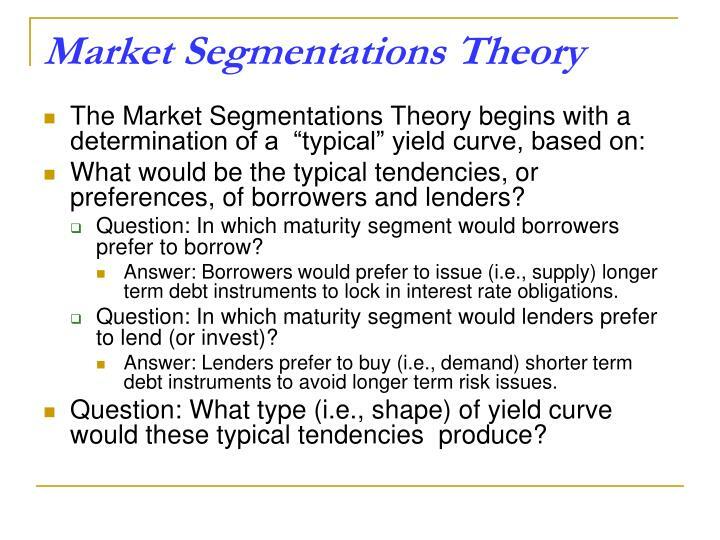 Assumptions of the Market Segmentations Theory: Each maturity segment of the yield curve (short term through long term) has its interest rate determined by the supply of and the demand for debt instruments within that maturity segment. 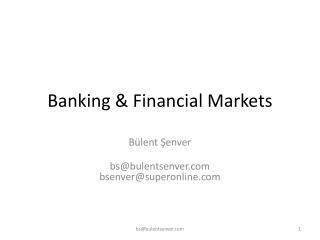 Thus, within the short segment, there will be a demand and supply schedule for debt instruments, and in the intermediate term and long term segments there will also be demand and supply schedules. These schedules are independent of one another. What would be the typical tendencies, or preferences, of borrowers and lenders? 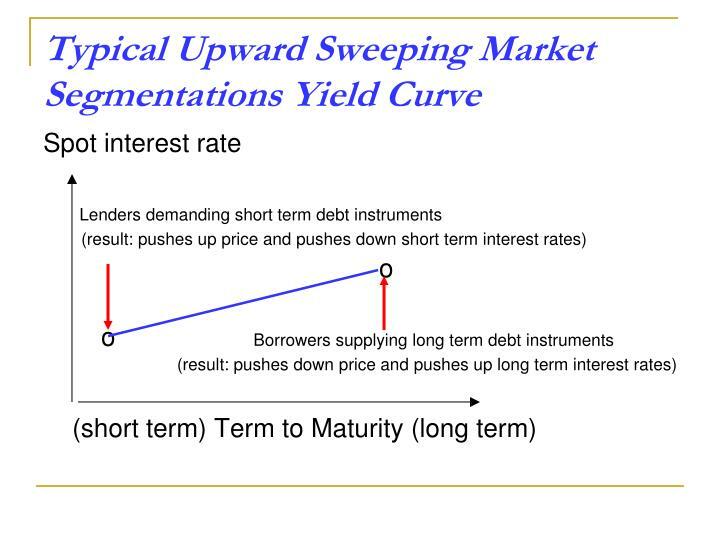 Question: In which maturity segment would borrowers prefer to borrow? Answer: Borrowers would prefer to issue (i.e., supply) longer term debt instruments to lock in interest rate obligations. 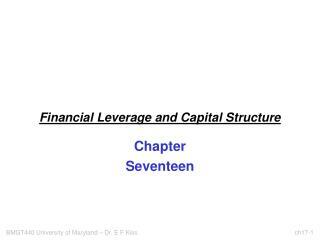 Question: In which maturity segment would lenders prefer to lend (or invest)? Answer: Lenders prefer to buy (i.e., demand) shorter term debt instruments to avoid longer term risk issues. 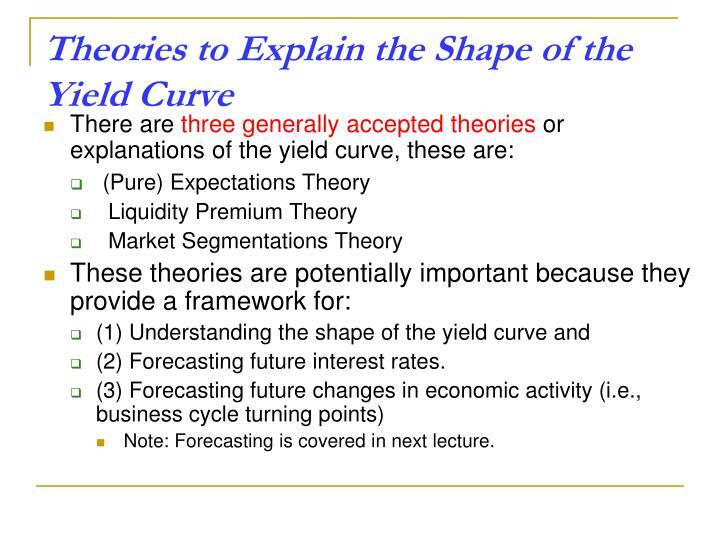 Question: What type (i.e., shape) of yield curve would these typical tendencies produce? 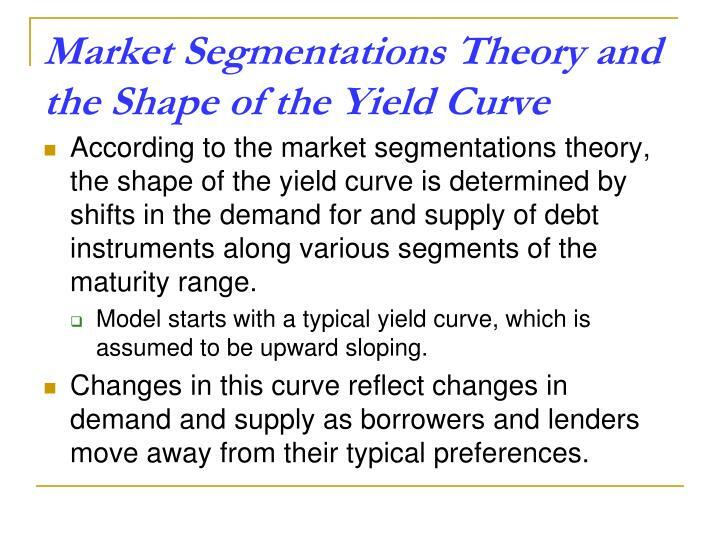 According to the market segmentations theory, the shape of the yield curve is determined by shifts in the demand for and supply of debt instruments along various segments of the maturity range. 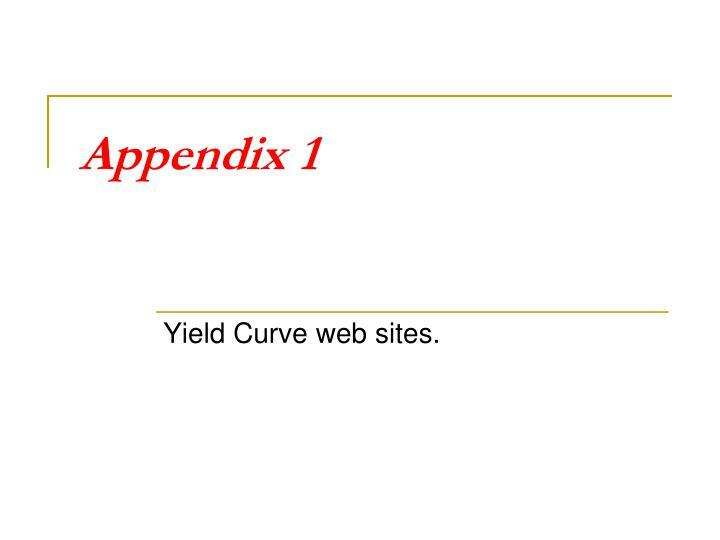 Model starts with a typical yield curve, which is assumed to be upward sloping. Changes in this curve reflect changes in demand and supply as borrowers and lenders move away from their typical preferences. Now a preference for issuing short term securities. 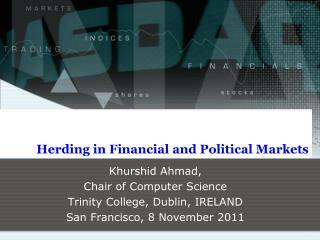 Now a preference for demanding long term securities. 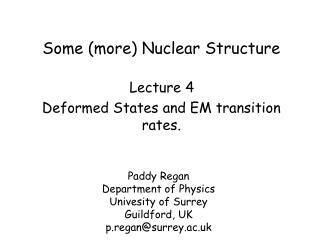 Why might this shift in preference occur? 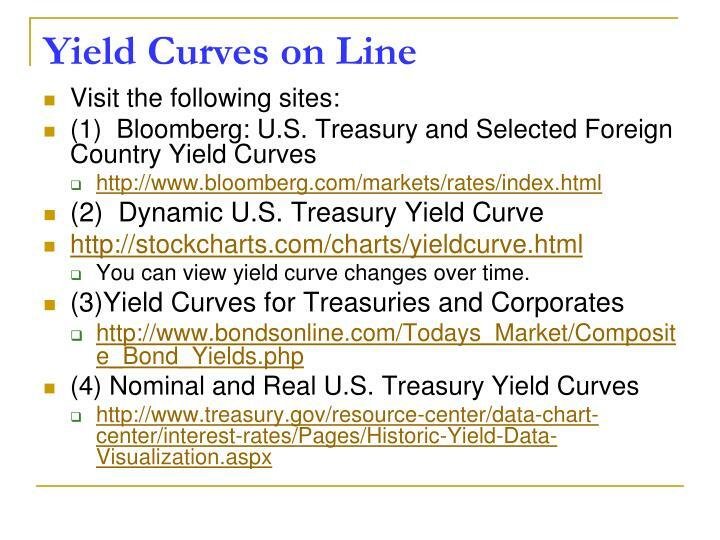 You can view yield curve changes over time. 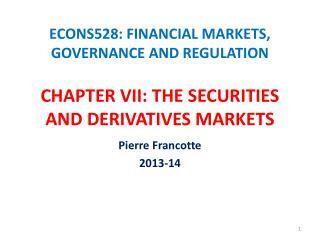 ECONS528: FINANCIAL MARKETS, GOVERNANCE AND REGULATION CHAPTER VII : THE SECURITIES AND DERIVATIVES MARKETS -. pierre francotte 2013-14.